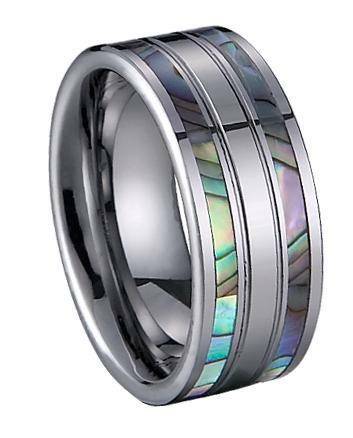 Seashells are not only some of nature's most beautiful decorations, but are tokens of great meaning, too.Seashells are commonly associated with love, creativity, and intuition.On this stunning ring, modern tungsten is offset by a hypnotizing shell inlay. Depending on the light, the ring hits an entire spectrum of colors, keeping it eternally unique and eye-catching. Comfort fit tungsten rings usually run 1/2 size larger, it is suggested you buy a half size smaller than your standard ring size. We recommend having your finger measured for a comfort fit ring at your local jewelry store for an accurate fit. All of our tungsten rings come with a lifetime warranty. My partner absolutely loved this ring. It's of beautiful quality and the shell inlay almost dances in the light. I couldn't have wished for a more perfect ring to give to him. I loved the ring. I did order at one size larger the my husband normally wears. It came in just as beautiful as the picture. And fits his finger perfectly. It came in very quickly and I am very pleased with it.